Why are Canadian doctors and media reluctant to come clean about CTE? When it comes to football Chronic Traumatic Encephalopathy (CTE) here in the Great White North, there appears to be a dearth of good old fashioned common sense and honesty. It would appear that just about all of the people all of the time are being fooled in Canada at present. And to paraphrase a famous recently departed movie drill sergeant: what is their major malfunction? Well, could it be that in some sort of colonial, nationalistic nonsense seemingly advanced by many Canadian media outlets, that the “science” behind the cause and effect of concussion and CTE as deduced by American researchers is “unclear,” be the culprit? Or even something somewhat more questionable, even untoward? 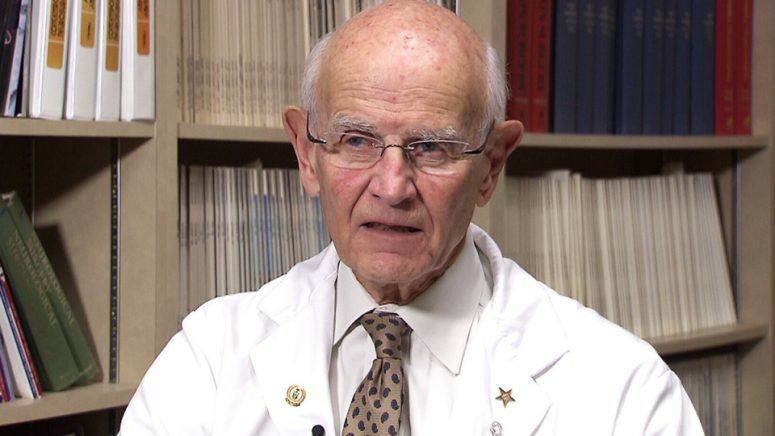 Because much of this “unclear science” muddying of the waters and parroted by the media, comes from Dr. Charles Tator who has maintained since 2013 that “extreme caution” must be exercised when diagnosing CTE from football concussions. Neurosurgeon Tator and his like-minded colleagues at the Toronto based Canadian Concussion Project appear to have problems with Boston University’s world class CTE research which proves a strong link between football concussions and CTE, again, for what appears to be likewise “unclear” reasons. That makes Tator the go-to guy for the Canadian media whenever football CTE rears its ugly head, no pun intended. Because for some “unclear” reason, much of the Canadian media seems to not notice the obvious discrepancies between BU’s research and Tator’s unless it is to question the BU researchers’ work and laud Tator as “renown.” And in fairness, Dr. Tator has devoted his professional life to the investigation of brain injury and caring for those so afflicted and his been so honored. Yet as far as his work with the CFL on CTE, there are legitimate questions as to his overall intent. Interestingly, Tator regularly appears on the CTV television network whenever a CFL concussion/CTE issue is raised. And interestingly as well, is that CTV is owned by the giant Bell Media which, coincidentally, runs TSN, which further of an interesting nature, owns the rights to telecast CFL games. Historically, except for Rick Westhead who reports on hockey’s brain injury lawsuits and former CFL star HOF quarterback, concussion victim, and TSN broadcaster Matt Dunigan’s statements, CFL CTE stories and TSN mix like Donald Trump and Feminists, especially when it comes to CTE related lawsuits. In this scenario, there is another interesting development: Tator, along with TSN, seem to have little problem with a hockey/CTE equation and some really fine, hard-edged work has been done by Rick Westhead on the topic. However, insert CFL concussions/CTE and all of a sudden, we have that old devil in the details “unclear science” demanding for standing. No such confrontational reporting on the CFL concussions crisis has appeared on TSN. Tator, especially seems to have problems linking concussions and CTE in the CFL and is currently engaged in a study of a larger number of former players and diseased brains. Forgive give me, but I, and former players like Phil Colwell who is leaving his brain to BU rather than Tator’s project, have some worries about an “unclear” study result ultimately favourable to the CFL’s current tobacco industry-like legal public defense. Obviously, the CFL is hoping for another “unclear” or “extreme caution” dictate from Tator and crew which certainly couldn’t hurt in any potential future lawsuits. There seems to be a “Canadian minds” angle; a direct reference to the distinction between the “superior” Canadian CTE researchers like Tator et al and those other damned Yankee ones in Boston always taking the stick and beating around the wrong end of the bush with it. Invariably, whenever BU comes up with some new football-related concussion reporting, some of the Canadian media’s biggest sportswriters will state something along the lines of “well BU is just looking for trouble,” or “their methodology is flawed,” as if they actually have any real bona fides to question BU’s research. Tator is again, usually front and centre in their opinions. Frankly, it comes off misguided, didactic and parochial at best, bizarrely deceptive at worst. Yet the “major malfunction” question is, why? What exactly is in it for some high profile Canadian media sportswriters to question the obvious cause and effect of football concussions and CTE? Sure, a paper like the Toronto Star would eventually have editorials stating that the CFL should admit the “compelling” CTE science compensate their wounded warriors, Editorial | It’s time for CFL to acknowledge link between concussions and brain damage but that is an editorial, not reporting something they had not previously, and to this day, addressed. And the paper ran an excellent, groundbreaking series by Steve Buist on concussion and brain disease by their Hamilton sister paper last year yet when an authorized piece on the rather curious goings on with Canadian CTE researchers and their interactions with the media by yours truly, the product of 2 months of work, is spiked. One of the most “interesting” Canadian CFL media sites is 3DownNation run by Hamilton Spectator football reporter Drew Edwards. The 3down site deserves some props as it is the first of its kind to make it as a standalone, professional independent CFL reportage site. It features some fine football writers like Steve Milton-not a CTE denier-and a member of the CFL sportswriters HOF, as well as others from across Canada. And although Edwards did link to some superb work on concussions by a colleague last year, as noted above, he appeared less than impressed by Arland Bruce’s concussion lawsuit. 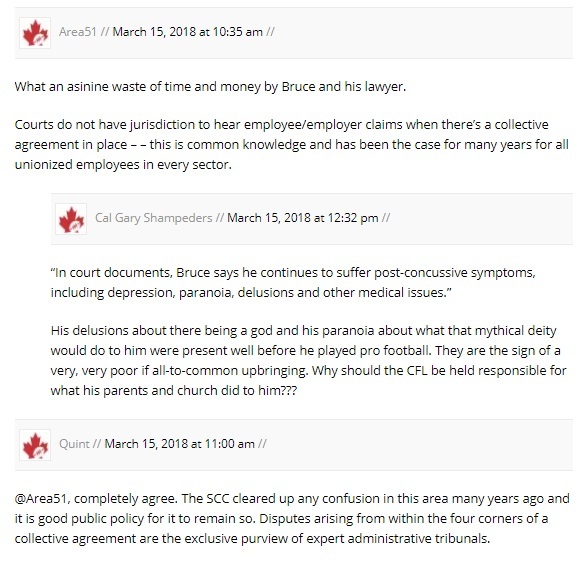 When it was eventually officially pronounced dead by Canada’s Supreme Court 3down subsequently featured some rather questionable character, and perhaps even racist comments about Mr. Bruce on the comment section. Yet, when the daughter of a former CFL player whose father is suffering from concussion injury e-mailed Edwards about her situation and received no response she took to the comments section of his site. More than a month later, he has failed to respond to or post her comments though comments are usually approved in only 30 minutes. Do some in the Canadian media actually believe that obfuscation or disinterest or something else will ultimately make the whole CTE issue eventually go away like this just completed long, hard Canadian winter? Do some in the Canadian media feel a silly, “Oh, Canada!” nationalistic pang for the CFL and in a misguided effort wish to shield it from those nasty lawyers with horrible bank busting writs in their dirty, greedy paws, as well as, oh those know-it-alls in that Yankee BU CTE tea party, in hope of sunny, happily ever gridiron after’s? Will some in the Canadian media frame the upcoming Arland Bruce arbitration hearing with the CFL for concussion injury as what CFL Alumni boss man and BU dueler Leo Ezerins once described as a “feedbag“? Finally, do some in the Canadian medical community have the guts to come out and question Tator and risk media ire and/or ridicule? I have on good authority that some are squeamish about upsetting the good the Doc Tator. Well, to the above, here’s a friendly little inquisitive shot across the bow.